Twelve years ago I was divorced. My job paid about six dollars an hour; I had twin 13-year-old daughters and a 15-year-old son. My mother let me use her home while she moved into an apartment when she could no longer climb her stairs. My mortgage payment took over half my paycheck. Needless to say money was very tight. That winter one of my daughters was very ill and I took her to the doctor. We got a prescription, but I had no money to pay for it. Before leaving on a business trip, my ex-husband left twenty dollars for the medicine. My daughter and I went to the grocery store pharmacy and I gave the prescription to the pharmacist. I had my car keys and the twenty dollar bill in my hand. After giving the pharmacist the prescription my daughter and I walked twenty feet to the greeting cards to pass the time. When we walked back to get the medication I noticed the twenty dollar bill was gone. We re-traced our steps but found no money. We went through all our pockets. Nothing. 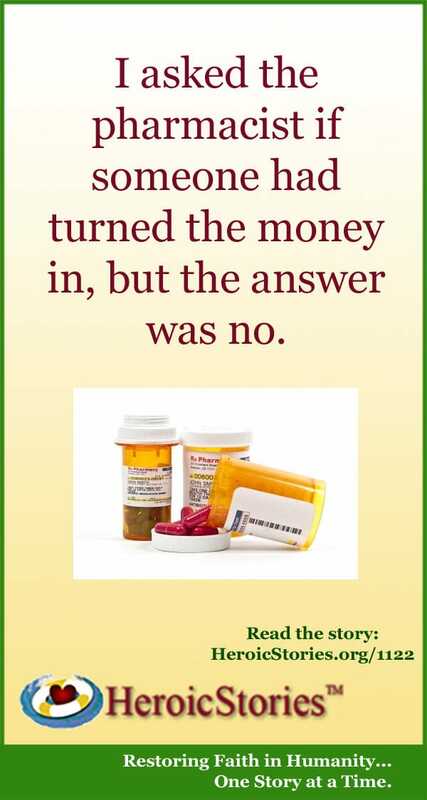 I asked the pharmacist if someone had turned the money in, but the answer was no. She was kind enough to make an announcement over the PA system, even saying the money was for a child’s medication. But there was no response to the announcement. The pharmacist gave us enough medication for the night saying we could return the next day to pay for and pick up the rest of the pills. Although that was a nice gesture I had no idea where I would get the money overnight. Meanwhile, a woman shopper heard the announcement, proceeded to the pharmacy, and paid for my daughter’s medication. I asked her name and address to repay her, but she wouldn’t give it to me. She told me to pass on the good deed. We talked a few minutes, and I found out that we both worked in the same field — with juvenile delinquents. She was very interesting and I enjoyed talking with her very much. After she left I asked the pharmacist if she knew the lady. She did, but of course couldn’t share her address because of confidentiality laws. She told me this woman was suffering from cancer and not doing well. She must have been going through treatments which caused her to lose her hair, because she wore a scarf like many cancer patients who have lost their hair. I never found out what happened to this kind woman. My daughter regained her health and I wished so much that this woman would regain hers. Indications from the pharmacist were that she died the following year. Never will I forget this kind woman who was willing to pay for my daughter’s medication while she was suffering from a disease she would never recover from. Thank you, gentle soul, for the way you so deeply touched my life. This story brought a tear to my eye. Obviously God needed her to help him in Heaven. Don’t know or care what this says about me, and won’t spend much time trying to figure it out, but, the more of these stories I read, the more I wish some day someone could write a story like this about me. Very inspiring. It says you wish to be as good and kind as the heros in those stories and if you ask me that is an honorable aim. This story reminded me that fear does not have to take our humanity away from us. The brave lady with cancer was able to overcome the horrible fear she was living with and respond to another’s fearful circumstances with compassion and generosity. got chills. some people are angels on earth.